How Cash Money Records Changed Rap ForeverExploring the enduring legacy of Juvenile, B.G., Baby, Turk, Mannie Fresh, and a young Lil Wayne. How Ariana Grande Dominated the ChartsHer success story is indicative of the ways in which chart success is measured circa 2019. The Weird Sadness of Aughts NostalgiaThe good art from the era came at the expense of great distress. Great Moments in Auto-Tune HistoryFrom the time that it was invented by some math guy to its liberal application by Kanye West, Auto-Tune has had a long and weird past. Lil Wayne Shows Off His Liev Schreiber Impression in Latest SNL PromoIt’s uncanny. This Week in Rap MusicFrom slick ’70s drug rap to vital California storytelling, and everything in between. Liev Schreiber and Lil Wayne Head to SNL November 10Behold your next SNL host–musical guest duo. Future Just Released an Album with Juice WRLDWRLD on Drugs also features Nicki Minaj, Lil Wayne, and Young Thug. Tha Carter V Is Lil Wayne’s Best Album in YearsIt is almost surgically all-inclusive. There are nods to every region of American rap music and nearly every era of Wayne. What’s the Best Album in Lil Wayne’s Carter Series?The New Orleans rapper uses the series to track his evolution, but how does each one hold up years later? Lil Wayne Releases Tha Carter V After Years of Legal BattlesXXXTentacion, Kendrick Lamar, Travis Scott, and Nicki Minaj are all featured on the long-delayed album. Lil Wayne Is Hip-Hop’s Best SkateboarderWhen he took a liking to the sport in 2010, he was met with befuddled jeers from the rap world. Jimmy Kimmel Got Like All the Rappers to Read Mean TweetsOkay so not all of them but like a whole lot of them. What Does Nicki Minaj’s Promo Art Say About Her Upcoming Album?Kind of a lot, actually. It Appears Lil Wayne Is Finally Free From BirdmanWayne has reportedly received a settlement in both his lawsuits and Tha Carter V may soon see a release. A Timeline of Drake and Pusha-T’s Slow-Burning FeudIt started out because of a BAPE sweatshirt. Migos’ Culture II Isn’t an Album, It’s a Data DumpNearly every song overstays its welcome. Hear Lil Wayne’s New Track ‘Big Bad Wolf’It’s off his upcoming mixtape Dedication 6 Reloaded. Drake and Lil Wayne Release New ‘Family Feud’ FreestyleThe pair borrow Jay-Z’s 4:44 beat. Lil Wayne’s Daughter Says He Is Fine After SeizuresLil Wayne was found unconscious on Sunday afternoon in Chicago. Lil Wayne Has Been Hospitalized Following Multiple SeizuresThe rapper’s Sunday-night show was subsequently canceled. 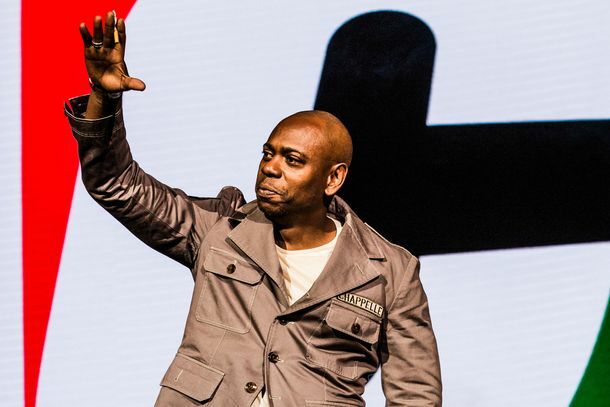 Chappelle Tries to Tackle Trump and Trans Issues at RCMH. He Doesn’t Succeed.At least the Roots were good. Hear Four New Songs From Lil WayneHe’s got the gift of gab. T-Pain and Lil Wayne Have Finally Answered Our Prayers and Released T-WayneIt’s been a long time coming. See DJ Khaled, Bieber, Chance, Quavo, and Lil Wayne Celebrate in ‘I’m the One’DJ Khaled reaches new levels of opulence. Nicki Minaj Takes One More Shot at Remy Ma in Her ‘No Frauds’ VideoIt’s royally ruthless. Alex Trebek Raps to Drake, Kanye, Lil Wayne, and Kendrick Lamar on Jeopardy!For $200 imaginary dollars: What is pure joy? Drake and Lil Wayne Tied for Hot 100 RecordThey each have 132 hits. Lil Wayne Teases a New Project Called Funeral Is ‘Coming Soon’So, forget Tha Carter V then? Watch Trailer for Tyler, the Creator DocumentaryFeaturing A$AP Rocky, Schoolboy Q, the Internet’s Syd, and more. Lil Wayne Reportedly Tried to Pull BLM InterviewWeezy allegedly let go of his publicists following the appearance. Lil Wayne’s Black Lives Matter Comments Were a Betrayal of His FansIt’s poor role-modeling. It isolates artist from audience. From Kendrick Lamar to Jay Z: The Best Rappers’ Worst Guest VersesKendrick’s new verse on Maroon 5’s “Don’t Wanna Know” is merely the latest entry in a subgenre so exclusive that it’s actively repellent. Lil Wayne Might Not Know Who Donald Trump IsOr he was joking. Hard to say. Read an Excerpt From Lil Wayne’s Prison JournalThe book, written during his eight-month jail sentence at Rikers Island in 2010, is out this week. Lil Wayne Believes Racism Is Over, But Also Knows That It Isn’tWeezy has a complicatedly simple relationship with racial discrimination. Feel Grateful While Listening to Lil Wayne’s New Song ‘Grateful’No retirement allowed, Lil Tunechi. Drake, Chance the Rapper Show Love for Lil WayneEven Young Thug dropped their beef to show support. Lil Wayne’s Universal Suit Reportedly on HoldThe lawsuit has reportedly been stayed until Lil Wayne’s other lawsuit with Cash Money and Birdman is resolved. Lil Wayne Cut Set Short Because Fans Too HighA lil on the nose, Wayne. Lil Wayne Announces Memoir, Shares Cover ArtAnd check out the cover art. See Lil’ Wayne, Wiz Khalifa in ‘Sucker for Pain’No pain, no gain? Here’s the Suicide Squad Soundtrack Song List Lil Wayne, Grimes, and CRR, let your powers combine. Lil Wayne Reportedly Had Two Seizures on a PlaneHe’s now recovering in a hospital in Nebraska.